Dirty solar panels reduce the amount of sunlight getting through to the solar cells and hence reduce efficiency. We have been monitoring the increases in efficiency that solar panel cleaning can bring for several years now. We frequently see sizeable increases of solar efficiency on agricultural sites, of up to 30%. On industrial and commercial sites, we have seen increases of up to 60% and on residential arrays of up to 21%. 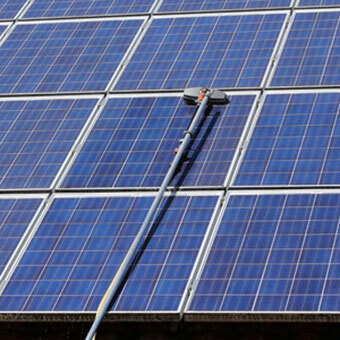 Some solar panel manufacturers and installation companies have made solar panel cleaning a condition of their warranty. If you do not have proof of regular solar panel cleaning by professionals and you have problems with your solar panels, they might not be covered by the warranty. We can clean your solar panels easily and safely for you from the ground with our high reach equipment and help you to maximise the efficiency of your panels and keep within your terms of warranty. Call us now on 02392 520205 or 07401 600604 and talk to one of our team.